the "florkens": Pregnancy is weird. Growing up, I always assumed that being pregnant would be weird but society assured me that when it was me... when it was my child... all that "perceived" weirdness would melt away and I would be overcome with the miracle that I was creating. Yeah... not so much. It's weird. Don't get me wrong - I'm thrilled to be pregnant. After our previous miscarriage, Adam and I could not be happier that everything seems to be progressing normally and that our little one seems safe, secure, and thriving in there. None of that however, makes pregnancy any less strange. A similar scene plays out each morning in my bathroom when I hop on the scale. Regardless of how the number moves, I simultaneously feel like a success and a failure. If the scale moves up, I have two immediate thoughts: 1) Yes! Grow baby grow! and 2) Crap! How many pounds is that overall? Will I ever be able to lose all of this once baby comes? If however, the scales stays the same or drops below the previous day's totals, I have two different thoughts: 1) Yay! Less weight to lose when this is over. Way to stay in control of your body Kate! and 2) Damn it! Is baby okay? Did I not eat enough? Did I exercise too much? AM I HURTING MY BABY?! What's worse than questioning your own use of your body is how other people suddenly feel free to do the same. Are you getting enough exercise? How much weight have you gained? Are you still vomiting? I just want to curl up in a corner, rock back and forth, and chant, "I don't know people! I don't know!" Even worse than THAT are those who think they can just reach out and touch you... or, in a recent case, "thump" you as if they are checking on the ripeness of a watermelon. Yes. I know I'm getting bigger. I see my pregnant belly every single day... I even get to see it completely naked so I know exactly how fast my belly button is becoming an "outie". Your running commentary and belly grabs aren't necessary... or solicited. Perhaps I should come to terms with the fact that as women, we are all different. For some, this time is magical through and through. They don't mind being the center of attention nor do they bat an eyelash at the weight they gain. They probably don't toss and turn at night worrying about exercise, food, and their fears of being an inadequate mother. 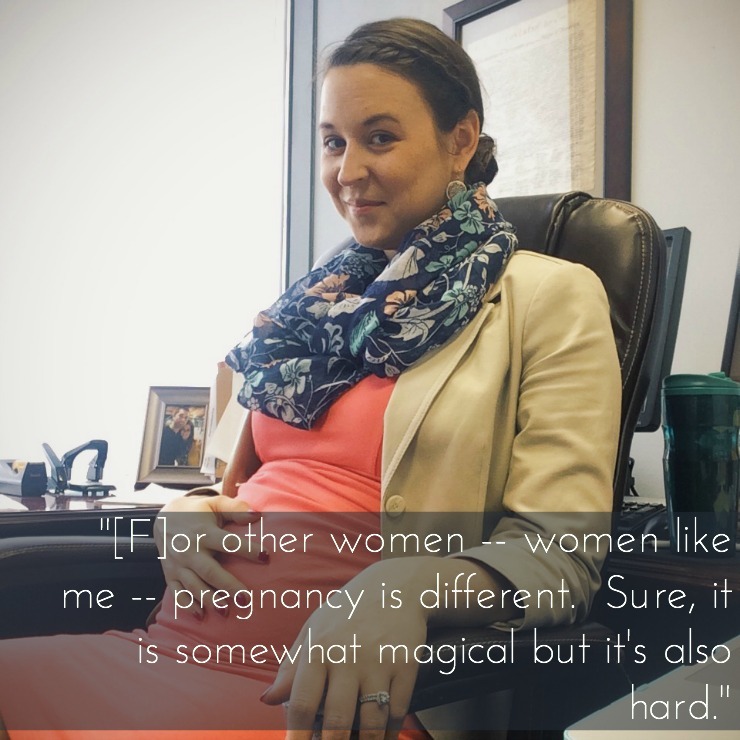 But for other women -- women like me -- pregnancy is different. Sure, it is somewhat magical but it's also hard. And neat. And life changing. It's stressful too. It's very long. It's tiring. It can be really funny. But more than anything, at least for me so far, pregnancy is just weird. It's a battle for myself and against myself all at once. It's a time where I cannot hide my personal life from society and yet, I seek desperately to do that very thing. It's a moment in time I want to freeze but also one where I hope time passes quickly. It's a daily battle to see myself, mentally, physically, and emotionally, as a prepared partner for the experience that is coming... parenthood. It's a time to cherish and prepare but also a time to freak the hell out. It's a journey and much like I said when I was a naive teenage, still over a decade away from encountering this beast, pregnancy is just a little weird. I do however, have a bit of new information I did not have in those pre-pregnancy days: Sure... it's weird, but it's okay that it's weird. It's 100% okay. And more importantly, I'm 100% okay. Ohhh yes. It is weird - I felt the same way. And parenthood is weird too - so much more than anyone warned me about. I guess the "weirdness" just changes a bit! There's all sorts of weirdness, but the weirdest thing to me is that I am currently 2 people. I went to get my hair cut the other day, and my stylist is pregnant with twins. I said to her, "Katie, we're 5 people standing here." We were both pretty tripped out by that. My daughter will be 4 in August, so I've had quite a bit of non-pregnant time to think it over and, even though my pregnancy was non-eventful and fairly easy, I still didn't enjoy it. It wasn't bad, but I really don't think I'm missing anything by not being pregnant again. "Pregnancy is weird" is all I ever say anymore. Once I was riding with my friend in her car and she told me she had to drive slow because there were three people in the car and it totally freaked me out. I also work with all guys in my office and they always make comments how I am not the only lady around here anymore and that also freaks me out. Add that to all the weird stuff that happens with your body and all of the sudden the only thing you can think about is how weird it all is. I would like to say it gets better but it doesn't. You just get more used to it. Except the touching. If you are anything like me you won't ever get used to the touching. I hated being pregnant! That is one of the main factors in our decision not to have any other children. Every woman has the right to feel how she wants about it...good for you for not letting society pressure you into forcing feelings you don't have! I think you summed it up perfectly! I can totally imagine pregnancy being weird as heck! You will rock this though. You and Adam have got this! I'm sure I worried about those things when I was pregnant, but I can barely remember them now. That's because whilst pregnancy can be all consuming at the time, it is very quickly forgotten (at least for a while) once baby comes along. I had a hard pregnancy. Not because I was concerned about doing it right, but because I really didn't enjoy being pregnant. Mum guilt set in early! You're supposed to love this amazing thing that is happening to you, but I was fed up with being in pain (back, hips, feet, you name it) and tired. I was desperate for baby to grow well and healthy, but also for it to all be over. I'm not sure about the belly grabbing thing. I don't know why people do it, but I reasoned that pregnant women just have this magnetism that makes people forget about apppropriate boundaries. Everyone knows you shouldn't touch a pregnant women's belly, but they do because you're like some magical creature and they get stunned by that. That's how I reasoned with it, anyway. I tried not to let it bother me, but I do remember being shocked when I went to view an apartment at about 6 months pregnant and the real estate agent grabbed my bump as she introduced herself!!! I am sure Baby Florken is doing great, you are doing all of the right things, and your little one will be here before we know it (no thumps included)! I am still so so so happy for you two!